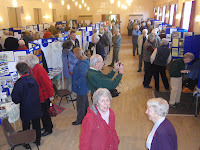 The Ponteland Local History Society was started forty years ago and a special exhibition was held in the Memorial Hall to bring together the diversity of organisations in Ponteland and to celebrate their achievements. It was a special event for the Mayor of Castle Morpeth, Irene Brumwell, who opened the exhibition. Councillor Irene admitted a liking for performing her duties on her home patch, especially since she has lived forty years in Ponteland, remembered some of the ‘old Ponteland’ and seemed to know everyone. There were forty organisations with fascinating displays of memorabilia and targets – that was the archers! Some had been founded just after the First World War, such as Ponteland WI, the Memorial Hall itself, and the Bowling Club. The Churches and First School had been there longer and the Civic Society was probably the most recently formed. Plants figured in many ways, leeks, fuschias, heathers, the National Conservation Society and the Friends of Ponteland Park. There was a wealth of material and expertise on display in Ponteland and many interested viewers. The Town Council came as well as the County Library service and the Local History Society pulled out all the stops to give a wonderful display of old photographs and items from its archives. Chairman John Turner and Michael Taylor and many others worked hard to put on such a wonderful day. No one in Ponteland can say they are bored. There is so much to belong to, so much to be involved in.